I was reminded very quickly when we arrived at the beach that there is a reason for pony tail holders (or hair ups as they're called around here since the girl renamed them) or hats at the beach. My long over processed hair immediately began whipping left, right, front and back until I looked more like Cousin It THAN Cousin It. Julia found treasure on the beach, a pony tail holder. You might think, ewww, that's gross. People, you can cook food in sand. It was hot so I was hoping any nastiness has been baked out, I was desperate. I figured worst case scenario I get lice and shave my head. I was willing to take that chance. 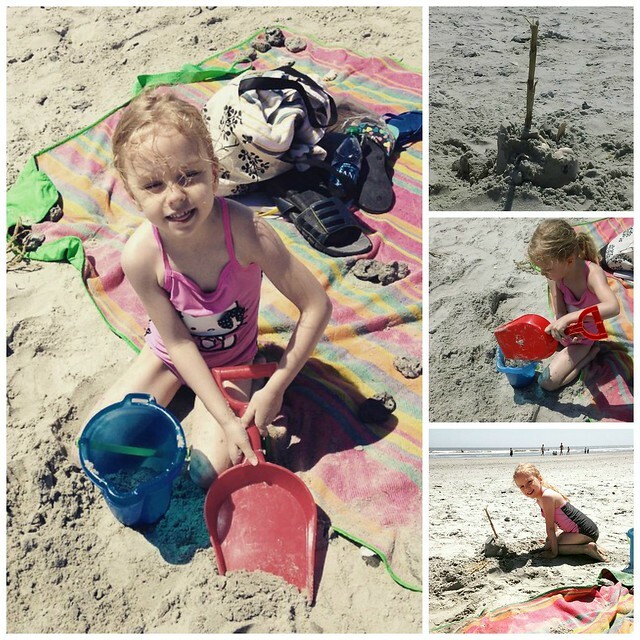 The beach itself was full of beach fun like sand castles and digging. Because, well you know, BEACHES. It was hot, in the 80s. The wind was cool, the sand was nice and toasty on ones toes. The water however, omg Atlantic Ocean EFF YOU. Ice effing cold. Death cold. Gripping claws of icy demons from the depths grabbing you and reaching for your soul cold. Ok, that's what Julia and I thought anyway. The boys liked it a bit more than that. What we did have though, was no meltdowns. The beach you see is one of Miles FAVORITE places, he loves even the ice cold surf. 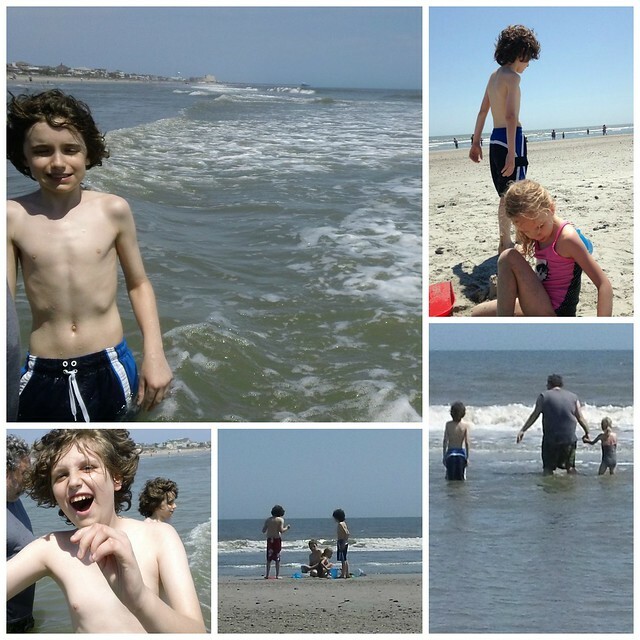 We had a day of sun and sand and some very cold water. We headed out to a local Mediterranean place (very tasty) called Manny's and had an uneventful dinner where pizza and Greek food was consumed happily by everyone. Despite the cold water it was one of our better days. Things went wrong at the beach like they always do everywhere we go. Charlie pooped in his swimming suit - which was kind of amazing and surprising, he's NEVER done that. How do you handle that? Well we realized it as we were leaving, so we just threw them away. We carry spare clothes everywhere we go. I've talked a lot about the tantrums and the stress of autism raining down on us as we vacationed but I just wanted to point out one thing - none of this is abnormal or "bad". This is just our life. The most important thing isn't how the tantrums interrupt or disrupt something, the most important thing is how we don't stop. We don't cave in, we don't cease activity or outings because of bad behavior. Our hostess at the diner that evening, without either of the boys doing or saying anything knew they were autistic. She asked what Charlie wanted to drink, and when Scott answered "Oh he doesn't speak" she smiled and said "Oh it's ok, my brother is severely autistic too." She then went on to talk to us about how much more independent he is now, and that she thinks he might be able to live alone one day. Obviously he's much older than my boys, but her calm acceptance of our different family made me just LOVE this place. 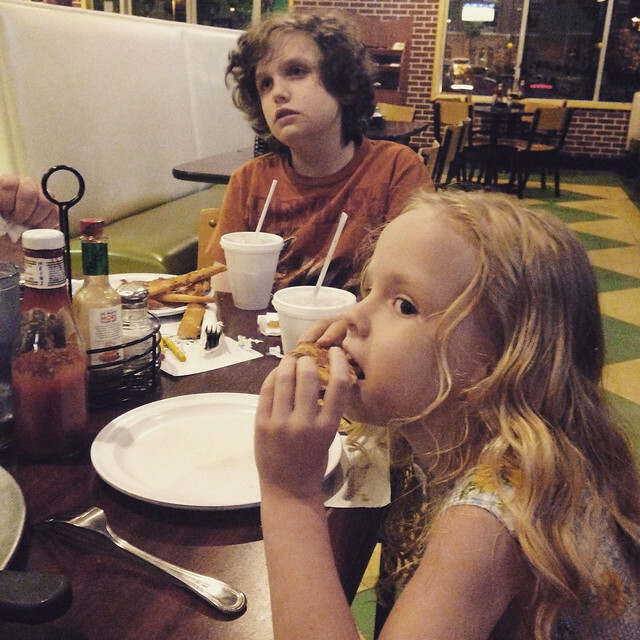 About halfway through the meal, as everyone gobbled down their delicious food and the boys watched the various TVs on the wall she stopped back by and said, "They're really doing great." We explained to her that we go out all that time with them and she told us about her mom teaching Autism pre-k, and her family. It was a perfect end of our last "vacation" night. I don't know that girls name but she gave me hope. I'd like to thank her but I forgot to. So if you're ever in North Charleston - seriously go to Manny's. They're good people there.